Sullivan, K., & Collett, P. (2014). Editorial. Studies in Self-Access Learning Journal, 5(4), 315-319. 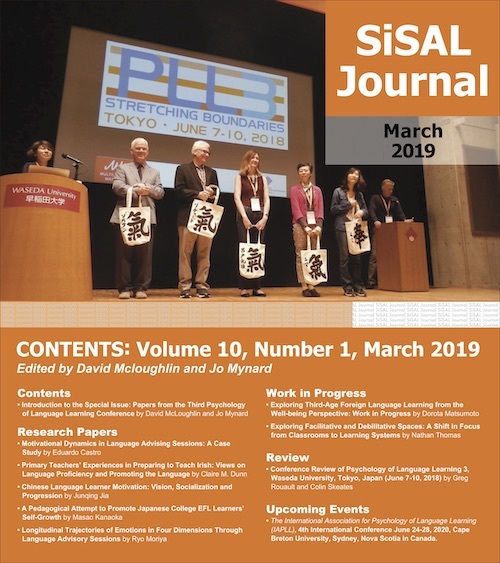 The idea for this special issue on self-regulation in foreign language learning arose from a symposium we held from December 7-8, 2013, at Shimonoseki City University. We convened the symposium with the support of a grant-in-aid for scientific research from the Japan Society for the Promotion of Science. This grant was awarded to help with the investigation of the use of supplementary learning materials designed to develop language learners’ self-regulatory strategies, a four year research project that is nearing conclusion. The aim of the symposium was not so much to showcase our own work, but to create an opportunity to learn from others and to share findings from practice and research. Through our participation at various conferences reporting on the results of our project, we had come to realize that there was significant interest in the application of self-regulated learning to foreign language studies, and, indeed, that there was a growing body of people engaged in research and educational practices related to this topic. We also noticed that many people involved in learner autonomy and self-directed learning were reporting findings similar to our own, so we were interested in achieving some sort of collaboration or discussion between educators working in these fields. The symposium brought up many issues which have influenced our own research and practices, and we hope that by sharing this with the wider community that the conversation will continue to grow. The articles in this special issue represent a diverse range of approaches to the investigation of self-regulation in foreign language learning. While most of the articles do not deal specifically with self-access contexts, we believe that the ideas discussed are applicable to various domains of teaching and learning. In their featured articles, Garold Murray and Yoshiyuki Nakata offer two different theoretical reviews of the relationship between self-regulation and learner autonomy, which we feel will bring greater understanding of the respective concepts, and how they interrelate. The research articles by Sakae Onoda and De Lourdes Rico-Cruz and Magdalena Ávila Pardo both consider contextual factors contributing to self-regulated learning, but from very different theoretical approaches. What we would particularly like to highlight are the analytical methods used in these two articles: structural equation modeling and discourse analysis, respectively. We hope these articles point towards possibilities for researching self-regulation. This issue also introduces several descriptions of practice which should provide insight into how the reader can approach the development of self-regulated learning abilities in his or her own teaching environment. Caroline Hutchinson describes a curriculum renewal project of an independent learning course which was conducted to recognize and incorporate the importance of teacher guidance in developing independent learners. J. Lake and Trevor Holster outline how a technologically-mediated approach to extensive reading can help develop reading gains while also promoting self-regulation. Fergus O’Dwyer and Judith Runnels place the spotlight on writing, introducing a process writing course that incorporates self-regulated learning cycles which work to not only develop learners’ writing skills, but also their ability to take control of their learning both now and in the future. Carla Wilson highlights the relationship between formative assessment and self-regulated learning, and describes her own classroom practices for supporting learner development in conversation courses. In our papers, we have reflected on issues that have arisen in our own research and practice. Paul Collett highlights matters related to the research of self-regulation in foreign language learning. Kristen Sullivan considers the issue of learner assessment in courses aiming to develop learners’ self-regulated learning abilities, and draws attention to links between self-regulated learning and learning-oriented assessment. Finally, Katherine Thornton reports on the Self-regulation in foreign language learning: Shared perspectives symposium. Going beyond a simple review, she discusses how presentations at the symposium led her to reflect upon her own practices as a learner advisor, and she provides her own take on the relationship between learner autonomy and self-regulated learning. For those new to the concept of self-regulated learning, Katherine’s piece may be a good entry point to this special issue. Please note that papers appear in alphabetical order by author surname. We would like to share our appreciation to all involved in the creation of this special issue. Firstly, a huge thanks to all of those who presented at and attended the symposium, and to all of our writers who have worked tirelessly on their contributions to this issue. Next, thank you to the reviewers whose insightful comments greatly aided the writers in shaping their finished papers. Reviewers are listed here in alphabetical order: Steve Brown, Neil Curry, Kerstin Dofs, Moria Hobbs, Jane Kehrwald, J. Lake, Paul Lyddon, Ann Mayeda, Garold Murray, Heath Rose, Alison Stewart, and Katherine Thornton. We are also extremely thankful to our copyeditors and proofreaders whose attention to detail really helped to polish the contributions to this special issue: Bethan Kushida, Elton LaClare, Phoebe Lyon, David McLoughlin, Jo Mynard, and Rob Werner. An extra special thanks to Rob Werner for double-checking the references of all articles. Finally, we would like to offer special thanks to Jo Mynard for giving us the chance to edit this special issue. Her generosity, guidance, and patience made this special issue possible. We have learned so much through this experience, and thank her for the opportunity.